Knowing which measurements to take into consideration can make life a lot easier when you are buying a replacement cylinder for your lock. If you are looking to replace an existing cylinder, it is best to remove the cylinder from the lock case to take your measurements. How do I remove a cylinder from the lock case? To remove the cylinder from the lock case, you will need to open the door and remove the faceplate from the lock case. In the forend of the lock case you will see a screw at just about the same level as the bottom of the cylinder. Remove this screw. The cylinder should now slide out of the lock case. How do I measure a Euro/Oval Cylinder? 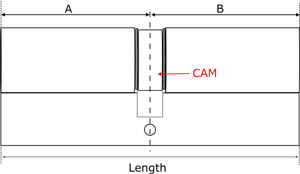 When you measure your cylinder, you will need to ascertain the length of each side. These sides could be of equal length, or the could be offset. Offset cylinders have one side that is longer than the other. You will also need to take into consideration the thickness of any furniture you may have on the door. i.e Handle Plates or roses or escutcheons. Don't forget to add these to the length of your cylinder to ensure it fits. (See Diagram A). 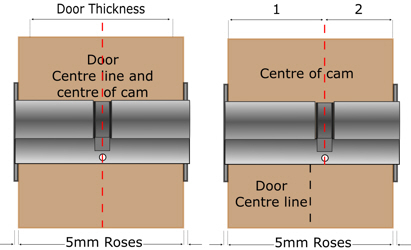 IMPORTANT - DON'T FORGET TO INCLUDE THE THICKNESS OF YOUR DOOR HANDLE OR ESCUTCHEON IN THE OVERALL LENGTH OF THE CYLINDER. There are 2 ways of representing Cylinder dimensions. 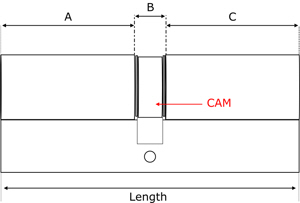 If you are measuring a cylinder that has a thumbturn on it, the measurements are of the case only. The thumbturn itself is not included in any measurements. Be sure, when measuring that if you need an offset cylinder with a thumbturn, that you note which side has the turn on it as cylinders with thumbturns are not reversible.